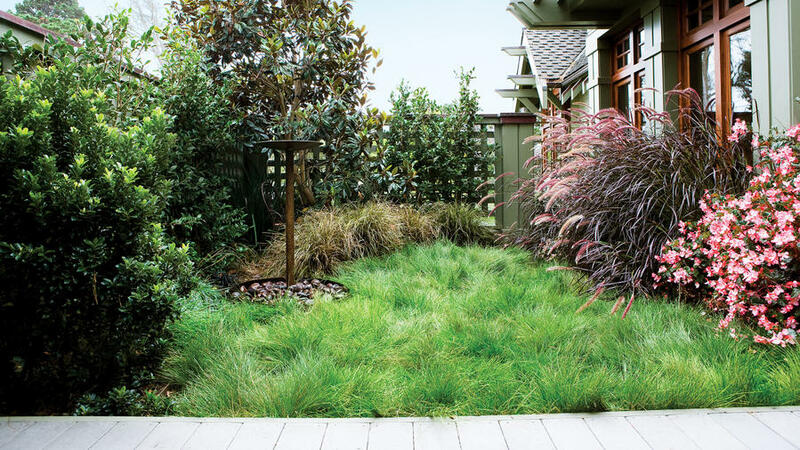 Choose a grass that’s a natural for your area. These grasses can live on rainfall alone in their native Western ranges, and they need mowing just once or twice a year to keep tidy. Details and sources below. Desert: Fine fescue, spring-planted buffalo grass, or blue grama. Northern California and the Northwest: Fine fescue and hair grass (Deschampsia). Rocky Mountain: Buffalo grass or blue grama below 6,500 feet; fine fescue above. Plant all in spring. Southern California: Fine fescue, spring-planted ‘UC Verde’ buffalo grass (along coast). Blue grama (Bouteloua gracilis). Native to the western Great Plains. A bunching perennial grass, it grows 1 to 2 feet tall and 1 foot wide. Stems carry flowers on one side only. Give it full sun, little water. Best in Sunset climate zones 1–3, 7–11, 14, 18–21. ‘Hachita’ Goes well with natives and perennials; if you don’t mow it, it can become an artificial short-grass prairie. Buffalo grass (Buchloe dactyloides). Native from Montana to Mexico and east to Louisiana. Grows 4 to 8 inches tall; has gray-green color in summer, straw color in winter. Turf varieties are selected for density and greener color. Female selections (always vegetatively propagated) have flowers at the base, so you don’t see them. Male plants have flowers on top, so they look ratty to some, attractive to others. 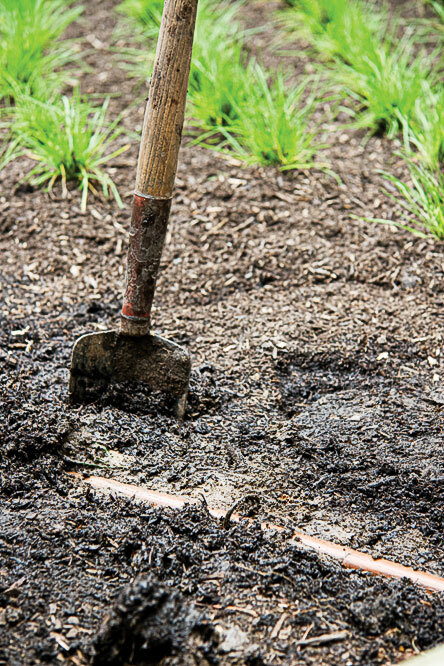 Add a 3-inch layer of clean, weed-free topsoil; rake smooth. Or germinate weeds beforehand and dig in compost. When you start this from seed, it always contains a mix of male and female plants. Give it full sun or open shade, some summer water (gets summer rain in the wild). A good garden performer in zones 1–3, 10–11, 14–16, 18–24. ‘Prestige’ Good in mild-winter areas. ‘UC Verde’ Developed by the University of California, this doesn’t go dormant along the Southern California coast and in mild areas, but inland (Riverside, for example), its dormant season stretches from October to March. There are several forms of fescue, including Arizona fescue, California fescue, and native western fescue; some are sold by native turf specialists. The most commonly available fescues are listed below. One, chewings fescue, is a close European cousin of a native western fescue. You may also find hard fescue and sheep’s fescue, both of which are used as meadow grasses in the West. Creeping red fescue (Festuca rubra). Native from Canada to Mexico on the West Coast, Canada to Georgia on the East Coast, Europe, and North Africa. Grows to 3 feet tall as a meadow grass, or can be mowed for use as a turf grass. It’s most drought tolerant when young; as it ages, thatch makes it less so (dethatching corrects the problem). Give it full sun or partial shade, little to moderate water. Seed only. Does well in zones A2, A3, 1–10, 14–24. Chewings fescue (Festuca rubra commutata). Native to Europe, this grass tends to come in more densely than creeping red fescue. Grows 3 feet tall as a meadow grass, or can be mowed for use as a turf grass. Give it full sun or partial shade, little to moderate water. Seed only. Does well in zones A2, A3, 1–10, 14–24. Tufted hair grass (Deschampsia cespitosa). Native from Alaska and Canada south to Northern California on the West Coast and North Carolina on the East Coast; also Eurasia and Greenland. Grows 1 to 2 feet tall and 2 feet wide, and produces clumps of dark green leaves. Airy inflorescences, which appear in late spring or summer, start green and fade to straw color; they can reach 4 feet. Give it full sun or partial shade, regular water (it can grow in damp meadows). A good meadow grass in zones 2–24. Pacific hair grass (Deschampsia cespitosa holciformis). Native from British Columbia to Monterey Bay. Grows 1 to 2 feet tall and 1 foot wide, and produces clumps of very dark green leaves. Inflorescences are narrow, coarse, and straw-colored. Give it full sun or partial shade, little to abundant water (it can take marshy or brackish locations). Best garden subject in zones 4–9, 14–24. Meadow grasses generally grow slowly and never get very big. That gives weeds an opening, so weed control is the biggest challenge in establishing a meadow. There are several ways to go about it. Sod If you plant meadow-grass sod, it will smother weeds below. Remove plugs from their sleeves; water well. Plant plugs about 8 inches apart. Use corn gluten, a pre-emergent herbicide, or hand-pull weeds until grass fills in. Topsoil Turf consultant Fred Ballerini prepares his site, then covers it with about 3 inches of clean (weed-free) topsoil before planting plugs. He doesn’t till the topsoil in, since that would just bring weed seeds to the top. Pregermination You can eliminate lots of weeds by preparing the site, then watering and waiting a couple of weeks. Weeds will quickly spring up. When they’re a couple of inches tall, till them in or hoe them off, then repeat the process. 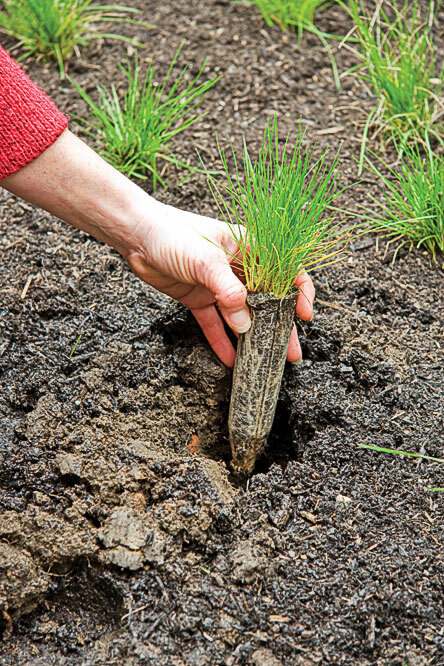 After the second round, plant your grass plugs. You’ll still get a few weeds, but not nearly as many. Preemergence herbicide Corn gluten is a good preemergence herbicide that feeds the new plugs (it’s about 10 percent nitrogen) and inhibits the growth of sprouted weed seeds. It’s a natural product (a byproduct of the manufacture of cornstarch). Most kinds do fine with 2 pounds of actual nitrogen per 1,000 square feet annually, and about half the water of a conventional lawn. Sources: Native plant nurseries; High Country Gardens for buffalo grass and blue grama plugs. Some sod dealers sell sod of blue grama and buffalo grass. Design: Michelle Comeau Landscape Design, Carmel, CA (831/620-0111) for Eric and Greta Miller, Pacific Grove, CA; turf consultant Fred Ballerini.